“I scream. You scream. We all scream for ice cream.” ~ Song Lyrics, 1927, by Howard Johnson, Billy Moll, and Robert King. When I was a child I was highly amused by this saying. I would run around saying it loudly – especially in the hopes that I might be rewarded with ice cream. I suppose that didn’t always work out. I suppose too that I was destined to be a writer. I thought the wordplay was funny and clever and I’d roll the “I scream” and “ice cream” around on my tongue and in my head over and over – playing with the nuances of pronunciation. It still amuses me, but I think rolling the sweetness of ice cream around on one’s tongue is a far more pleasant occupation. Now I write this story to tell you about Bishop. It’s a great destination for family adventures and in summer the best trips start and end with delicious ice cream. No need to scream just visit Brown’s Town Campground, Café and Country Store. It is Bishop’s most beautiful RV and tent-camping resort. It is the perfect place for a fantastic family vacation and the best part is …yes, you can start your vacay here with ice cream! In fact, even if you’re just passing through stop here for ice cream and an introduction to life in the old west. The quaint café and country store features an old-fashioned ice cream fountain, homemade pies, souvenirs, camping supplies and fishing tackle. Take a walk along the Old West Main Street open air museum to see how life was once lived in these here parts. The expansive, treed grounds have 150 grassy sites for tents and RVs with full hookups. There’s so much here onsite to make everyone in the family happy, plus it’s within easy access to a multitude of wonderful activities you and your family can enjoy in our big backyard. Now let me tell you about another of our perfect places for a family fun adventure where, you guessed it, you can get ice cream. Lake Sabrina Boat Landing and Café is nestled in the high mountains of the high Sierra in Bishop Creek Canyon. Getting there is a spectacular drive of about 20 minutes from the center of town west on CA State Route 168 (W. Line St.) deep into the heart of our big backyard. If you plan to stay up here, there are at least 15 options in the Bishop Creek Canyon area for camping or lodging that will delight an adventurous family. Take a look this previous blog on camping up here to get you hooked on the high Sierra. Take the family to Lake Sabrina (pronounced by locals as “Suh-BRY-nah”) for a scrumptious breakfast or lunch, rent a kayak or stand-up paddle board and cruise the lake, or set yourselves up for a day of fishing, and for sure end your day with homemade pie and homemade vanilla ice cream. This amazing, incredible, wonderful, spectacular, fun-filled festival is held right here in Bishop every Memorial Day weekend. If you haven’t ever been to this “Celebration of the Mule” you really must bring the family and experience this real-life, full-color, high-energy, old-west tradition. Yup, I used a lot of superlatives, but it really is a super-wonderful event. It began in 1969 as a send-off event for local packers and outfitters to get the summer season going. 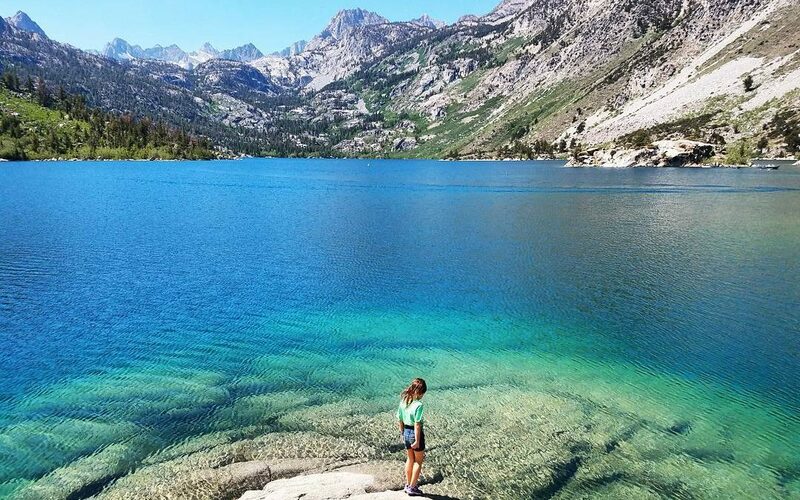 So, get your summer season going by learning and experiencing a little more of what makes the Eastern Sierra so special. Here is our essential guide to Mule Days and this is the official Mule Days page. We have more options for swimming than you can shake a towel at. There’s the local public swimming pool, beautiful ponds and sublime hot springs, the rough and tumble river and numerous creeks and ponds all within just a few miles of beautiful downtown Bishop. At the Bishop city pool you can swim, slide and dive into the cool, clear and clean water of the municipal pool all summer long. It’s the center of the fun universe in the Bishop City Park that comprises 44 acres of parkland where the city maintains this lovely swimming pool (open from Memorial Day to Labor Day), baseball fields, tennis courts, a skate park and bike park, an off-leash dog park, picnic tables and picnic pavilion, a beautiful pond and over-water gazebo, children’s play structures, outdoor fitness center and bocce court. The city park is in the heart of Bishop with easy access on safe sidewalks to shops, restaurants and entertainment facilities – many of which have access for the handicapped. The park is the designed for all ages and all abilities as are many other areas in the Eastern Sierra. Read more about accessibility for the disabled in our area in this previous blog. Oh, please don’t swim in the park creek and serene park pond – these are reserved for the ducks and other wildlife. But you can buy a little bag of special duck food, at the Visitor Center, and feed our feathered friends a healthy, balanced ducky treat. One wonderful pond situated just a few miles from Bishop is Millpond Recreation Area. This is a perfect place to bring the whole family for a fun day of wading and swimming, kayaking and stand up paddle boarding, picnicking and playing, and lying on the soft green grass under a shady tree. There are gazebos with tables and barbeques, a kids’ playground and it’s an awesome place for a big ol’ family bash. Gazebos may be reserved for special events. This magnificent river wends its way along the Owens Valley floor, just a few miles east of Bishop, to create a verdant, riparian area that has a few perfect, natural swimming holes and artesian wells. Gliding along the moving water on top of a float tube is also a popular summer pastime. Access to and safety of swimming in these spots or floating along the river varies from year to year and is entirely dependent on winter snow and annual rainfall. Some years the river runs high and fast and other years it’s dry and shallow, but most years it’s a pretty perfect place to play and splash in a setting that is breathtakingly beautiful. If you want to spend a day of water play on the Owens River or splash in a nearby pond or creek, pop into the Bishop Visitor Center (or call ahead) and speak to the knowledgeable staff there for to up-to-date info and recommendations. When you’re looking for a good family hot springs experience Keough’s Hot Springs is it! This is a marvelously soothing and fun hot springs resort that was built in 1919. The resort harks back to its heyday of the 1920s & 30s when it was a first-class health resort. Much of the original wooden structure is still intact and the two pools, a large swimming and a smaller soaking pool, are the original ones built in 1919. A constant flow of hot, fresh mineral water fills the pools, making this a wonderful place for family frolicking in the big, warm pool and languishing in the small, hot soaking pool. Enclosed on all four sides the pools are protected from the desert wind, but open to the sky above. Sun bathing is an option almost all year. Keough’s was conceived as a place to get away and get close to nature. Almost 100 years later it still delivers on that promise. I would be remiss in not telling you about this gem. It is family friendly and you get your very own private hot tub with a campsite, bungalow or room at the Inn. Each is unique and you should come often and try them all. Benton Hot Springs is situated 30 miles north of Bishop on US Highway 6, nestled in the rocky hills between the White Mountains to the east and the Sierra Nevada to the west, where the past and present meet in a remote, tranquil setting. Perhaps this romantic resort is perfectly suited to a family of two – if you get my meaning. Now, in case you didn’t know this, the Eastern Sierra is a world-class fishing destination. Fishing in the lower Owens River is open all year long and California general trout fishing season runs from the last Saturday in April through November 15th every year. There is an abundance of fishing spots, which are suitable for both beginners and experienced anglers and many are close to town. The local youth can often be found fishing in the neighborhood canals and families will spend many an afternoon or day along the shores of the Owens River or Pleasant Valley Reservoir. Going further afield to the lakes and streams of the high Sierra offers seasonal fly and bait fishing opportunities. Anglers over the age of 16 require a valid California Sport Fishing license, but two free fishing days a year are open to fishing without a license. These are the first Saturday in July and September each year. More information and updated dates for each year can be found on the CDFW’s Free Fishing Days webpage. Before you head out for fishing make sure to find out about all rules and regulations, such as catch limits, declared ‘catch-and-release’ places, and waterways that are closed to fishing, etc. If this sounds like a great adventure for you and your family and you need a little more advice and encouragement to go fishing, then read up about getting your kids ready for fishing on this previous blog. The Eastern Sierra is well-known worldwide, as a premier hiking destination. The Pacific Crest Trail, the John Muir Trail and the hike up to the highest point on the continental US; Mt. Whitney, are major draws for hikers from around the world. It’s not unusual for some hikers to hit the high Sierra trails with kids, but that requires good backcountry trail experience and plenty of planning. You sure could do that, but for a just a few hours or a day outing in the mountains there are plenty of excellent hiking trails that are suitable for families and furry friends. Spring and Fall are definitely the best seasons for hiking at the mid- to lower elevations. Summer is a time for going up into the alpine regions of these majestic mountains and winter walks in the foothills and along the valley floor are magical. A few previous blogs have more detail about hikes in winter and some super spring hikes around Bishop. The fall color in the Eastern Sierra is a magnificent sight to behold and many of the great spots for fall color viewing are along easily accessible hiking trails. A fall color blog from last year has tons of info on when and where to see the change of season. How about that? There’s a hike for almost everyone in every season. Most kids love getting dirty. Perhaps boondocking with your kids is a wonderful way to get out and get dirty in a safe and natural environment. The opportunities for dispersed camping near Bishop are numerous and the expanse of this high desert environment will give you freedom to play and explore. Many of these areas are relatively close to town so you can mix up your play days with the kids by spending some time outdoors and some time indoors – perhaps at the bowling alley or movies. Higher up the mountains and into the backcountry will provide more options for dispersed camping and, in effect, the options for primitive camping are varied and year-round. As with so many outdoor activities on the Eastside, summers are best spent at high elevations and winter is great on the valley floor. Spring and fall are super at the lower to mid-elevation range. Whether you decide to camp near town or well into the wilderness choose according to the season and take some time to learn about what you can and will experience. Be sure that everyone in the family is comfortable with the challenges that might be presented. Primitive camping can allow for light RV access, car camping and tent camping and ‘roughing it’ can a great time to teach kids about the natural world. Take a look at this previous blog about camping successfully with kids. Research indicates that one-third of humanity, and that includes 80% of Americans, cannot see, and has probably never seen, the Milky Way. Most Americans cannot see stars at all due to light pollution where they live. If this is true of you and your family, you really must come here and see the Milky Way in all its spectacular, sparkling glory. The night skies here are unimpeded by light pollution and the high desert climate contributes to producing crisp, clear nights. Winter is the best season for star gazing as cold, clear winter nights present optimal conditions for night sky viewing. Two factors contribute to this: 1) the nights are longer, and 2) cold air holds less moisture, which means more transparency and greater clarity. Notwithstanding that, night sky viewing is a year-round activity in the Eastern Sierra as some destinations for super dark skies are not accessible during winter. Summer months offer warm, dry nights that make this a perfect time for teaching kids about the cosmos. Another brilliant way to learn about the stars is at the Owens Valley Radio Observatory (OVRO). This state-of-the-art radio telescope array, affectionately known as “Big Ears,” is situated just east of Big Pine, 15 miles south of Bishop. It is run by the California Institute of Technology and is one of the largest university-operated observatories in the world and hosts numerous projects in radio astronomy and cosmology. Public tours and lectures are offered regularly and this is definitely the place that will open eyes and expand horizons for you and your youngsters. A blog post from last year has more detail on our marvelous night skies. Take a look at it here. I scream, “I love Bishop!” I’m so lucky to live here. Now I’ve convinced you to vacay here with your kids and furry family members, right? Just in case you need a few more tantalizing temptations let me tell you about food, fun, shopping and lodging in town. There are 21 super lodging facilities that run the gamut from simple motels, to quaint bed and breakfasts to modern downtown hotels. Our beautiful big backyard is easily accessible from anywhere in Bishop and these facilities will provide the perfect home-away-from-home for your family. Take a look at the list of Bishop lodging here and find the one that’s right for you. If your holiday is specifically geared towards the kids and at those times when the great outdoors begins to feel a little overwhelming – which it can if they are more used to the concrete jungle – then take some time to do some activities that are more familiar to them. There’s a fun bowling alley and our country-style movie theatre will entertain all flagging spirits. Maybe play a little tennis or go skateboarding in the park. Pack your sporting gear and check out the venues here where you can keep your skills on track. There’s an awesome 18-hole public golf course here. Perhaps now is the time and place to get your youngster into your favorite game. We have a world of good food in Bishop. We may be a small, quiet, country town, but because we welcome tourists from all over the world we have a super selection of restaurants, bakeries, coffee shops, and a micro-brewery. 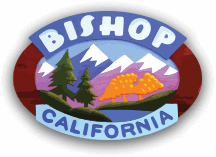 Bishop is a family-oriented town and our stores and shops are locally owned and operated, so you’ll be treated with good old-fashioned customer service. In addition to all these great adventures there’s also rock hounding, flower spotting, wildlife viewing, rock climbing, horseback riding, and mountain biking to keep a family occupied in the great outdoors. Bring your own gear or sign up for guided tours with one of the many adventure services here in town. 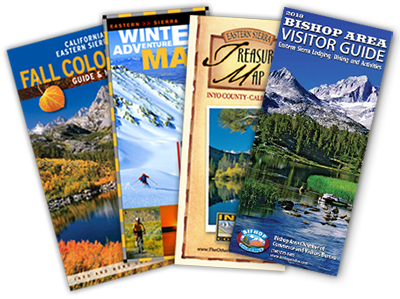 Call or stop in at the Bishop Visitor Center to get lots more details, maps, directions and your secret map! Aha, I didn’t tell you about that did one I? Tell them Gigi sent you and you’ll be treated like family. Stop by: 690 N. Main St., Bishop.